Bush Search and Rescue were called out to search for a missing deer hunter in the bush at Tomahawk Hut near Mount Stirling and departed Melbourne 08:00 on Monday 6 June 2011. Mon 6/6. Fourteen searchers arrived and commenced searching. Searching was very difficult due to the terrain, vegetation and weather. Many search groups returned to base at dusk. Tue 7/6. Ten more members joining the search on Tuesday. Snow storms coated much of the vegetation and made the steep terrain in the region treacherous and difficult to negotiate. Despite both extensive feature searching of nearby terrain and intensive searching near the point last seen near Tomahawk Creek, the missing person had not been found. Wed 8/6. Searching resumed early on Wednesday after 15cm of snow fell overnight. Sago snow and hail fell during the day with continued bad weather contributing to difficult search conditions, with the missing person still not located. Thu 9/6. 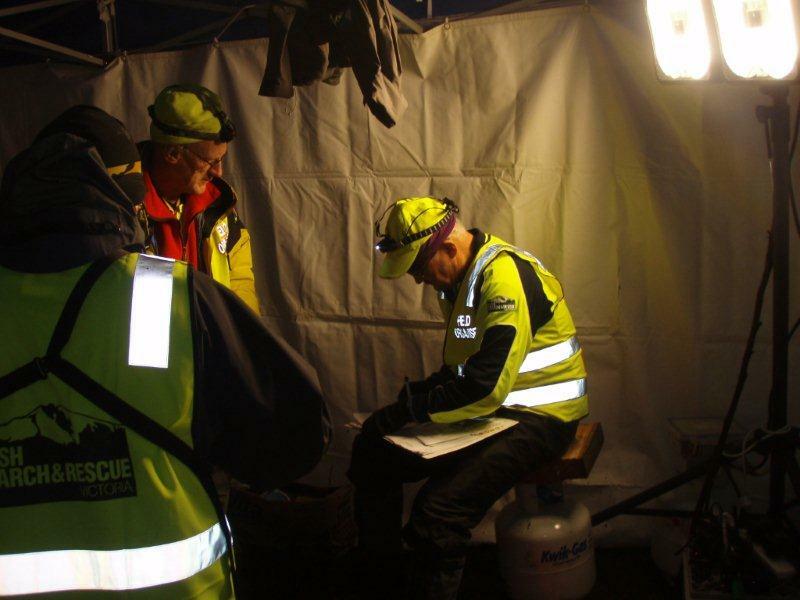 A third BSAR call-out departed Green Street Northcote at 4am with 13 more members joining the search. They arrived at search base at 09:00 and commenced searching soon after. Further feature searching was conducted throughout the day, with temperatures around 6C. The missing person was still not located. Fri 10/6. BSAR members partipated in line searching during the day in improved weather conditions. Unfortunately, the missing person was still not located. All BSAR members departed the search base mid afternoon and returned to Melbourne. Police and other services are continuing with the search. Sat 11/6. Police finished searching on Saturday afternoon with no result. Mon 13/6. The search scaled down significantly with David Prideaux unfortunately not located. The location will be revisited over coming weeks prior to heavy winter snow, and again in spring if necessary. Patrols of bush tracks in the area will continue. Wed 15/6. A number of search and rescue personnel continue to searching with the assistance of search dogs. Police continue to ask people not to enter the area intending to continue the search on their own. Group briefing prior to searching on Tuesday 7 July. Bush Search and Rescue Field Organisers at Tomahawk Hut search base. Photo: Sergeant James Bate. Updated 20:38 Sat 18 June. Peter Campbell.